If you have TV Aerial problems or satellite installation enquiries regarding a Sky, Sky HD, Freeview, Freesat or multi-room system, call our experienced team for polite and friendly advice today. From Freeview aerials, TV aerials installation, digital aerials and more. Our installers carry a full range of indoor and outdoor aerials at all times. Their repair and upgrade work is quick & efficient. Aerial Services was established in 1968 by Frank Garvin who was also a founder member of the Confederation of Aerial Industries (CAI) which we are still active members of today. All of our engineers are both experienced and well trained, carrying CSCS Health & Safety cards as well as company ID badges. 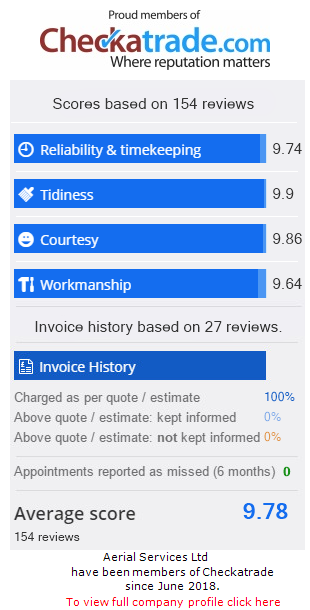 We strive to offer a professional and personal service as we are always available to answer questions either by phone or email, and we always aim to do a good job at a fair price. Should you think you may require our services, please give us a call on 020 7582 8888 or contact us here. At Aerial Services we have specialised in installing TV Aerials since 1968. For a professional job carried out by a fully trained engineer, call Aerial Services today. If you have a new freeview device or having problems with reception. We cover all of London and Suurounding areas and can install your Freeview compatible digital aerial. Sky broadcasts the widest range of TV viewing options in the UK and more HD content than any other service providers in Europe. As Sky agents, Aerial Services are perfectly placed to bring Sky’s products to your home today. Freesat was launched in 2008 by the BBC and ITV, currently providing around a hundred free digital channels via a satellite dish. There are a huge range of foreign channels available on numerous satellites. With an 80cm dish and a satellite reciever you will be able to recieve hundreds of free stations. We can provide any number of additional TV points around your home. If you have ever thought about a TV in the back room, loft conversion, kitchen or even the bathroom, we can install it for you. At Aerial Services we can supply and install the latest flat 1080p HD screen in your home so that you get the full benefit from your chosen TV package. Please click her to see our offers of the month. We are always looking at ways to reward our loyal customers.